December 19, 2011 - When GE Aviation acquired the Czech airplane engine maker Walter Motors four years ago, Walter was an 80-year old turboprop business with some glorious history and top engineering talent. Walter’s workhorse product was the M601 engine. There were some 1,500 of them in service around the world, accumulating 17 million flight hours. But the M601 was developed in 1976 and badly needed an upgrade. With no capital to spare, Walter was doing little more than servicing the engines it had produced. GE saw a great promise. The company was seeking to lift its presence in the turboprop market and Walter could help. After the Walter deal closed in 2008, GE tasked teams of aviation engineers in Ohio and Massachusetts and their Czech counterparts to apply U.S. know-how, advanced materials and three-dimensional aerodynamic design techniques, and slim down and rebuild the M601. The result was a new GE turboprop called H80. It took a maiden flight in 2010. This week, the European Aviation Safety Agency (EASA) certified the engine, a milestone GE celebrated in Prague, the Czech capital, in the company of U.S. Charge d’Affaires Joe Pennington and Czech Minister of Industry and Trade Martin Kuba. The H80 takes the elegant and robust design of the M601 and combines it with advanced materials and sophisticated technologies to create a more powerful, fuel-efficient and durable engine. For example, the new design allows the engine to operate more efficiently in hot weather, especially during the take-off, and deliver more shaft horsepower and faster high-altitude cruise speeds. 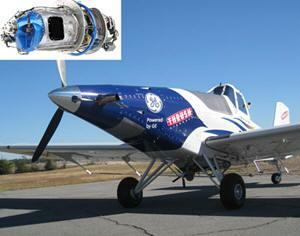 The versatile engine can power commuter planes as well as agricultural aircraft. The company has already lined up a number of customers both in the U.S. and Europe. For example, the engines will power the U.S.-manufactured Thrush 510G crop duster, the latest Thrush model, as well as the Czech-made L-410 passenger plane. GE currently plans double the production of the H80 from the 70 engines per year in 2012 to 150 engines in 2015. This airborne L-410 commuter plane is powered with two H80 engines. The H80 will update the legacy M601 in several ways, including power and efficiency. The H80 will be a significant power upgrade over the M601, reaching 800 shaft horsepower (shp) rather than the 650 shp of the M601. Another important upgrade to the engine will be improving its hot day performance. That improvement is a major reason why the H80 was selected to power the Thrush Model 510 as a crop duster for Afghanistan.